Non-Toxic Munchkin: Graco, Baby Trend, Cosco, Evenflo and Safety 1st: Stop Putting Toxic Chemicals in Our Children's Car Seats! Graco, Baby Trend, Cosco, Evenflo and Safety 1st: Stop Putting Toxic Chemicals in Our Children's Car Seats! 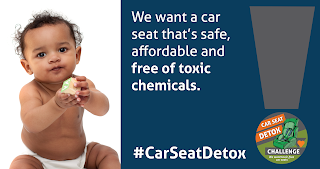 With the launch of the first ever flame retardant chemical free car seat this month, many parents sighed in relief at finally having the option to purchase a car seat for their little munchkins that would not expose their children to toxic chemicals. But, with a price tag of $350 many more parents signed in frustration at the reality that they would not be able to afford the high end Uppababy Mesa and would still have to choose from car seats that contain these toxic chemicals. As a parent you can’t help but ask yourself: of one company was able to develop a flame retardant chemical-free car seat, while still adhering to all legal requirements, why have more companies not followed suit? even when some companies claimed not to be using these chemicals). In recent years they discovered a trend where the higher end, more expensive car seats, were using less toxic chemicals, while affordable car seats, were still relying on the most toxic of flame retardant chemicals: brominated FRs. Exposure to brominated flame retardants, is particularly worrisome for children because the chemical bio-accumulate in their little bodies, and are associated with an array of harmful effects, including reduced IQ, developmental delays, autism, hormone disruption, reproductive harm, obesity, and cancer. Deciding that enough was enough they are now spearheading a campaign to challenge major car seat manufacturers to detox their car seats. 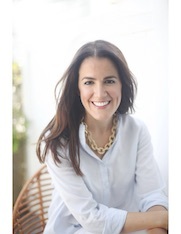 I spoke to Melissa Cooper Sargent, Green Living Resource Director for the Ecology Center, who explained more about their latest endeavor and how and why we, as parents, can and should get involved. Non-Toxic Munchkin: Why are flame retardants chemicals in car seats something parents should be worried about? Non-Toxic Munchkin: How big of a problem is this in the industry? How many car seats have tested positive for flame retardants? Melissa: Every single one of the hundreds of seats we have tested, except for the UPPAbaby Mesa Henry. The problem is widespread. That is why we are calling on five different brands. The federal flammability standard placed upon the car seat companies (the US’s current laws) is ineffective and needs to change. We encourage policy makers to exempt child car seats. But, as long as children’s car seats are subject to these standards, the best approach is to redesign them so that hazardous chemicals are not necessary. Non-Toxic Munchkin: After so many years of testing car seats and finding known toxic chemicals in every single one of them, how do you feel about the launch of the new Uppa Baby Mesa car seat in Henry fabric? Melissa: We are heartened to see this seat on the market. This seat raises the bar for all of the other companies by proving that it is possible to meet flammability requirements without chemicals. They used modern innovation while at the same time taking design back to the basics by utilizing wool to achieve fire retardancy. 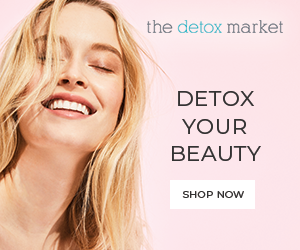 Non-Toxic Munchkin: Currently, what car seat would you recommend to a new parent looking to buy a safe and non-toxic (or less toxic) car seat… who cannot afford the $350 price tag that the Uppa Baby has? Melissa: After the UPPAbaby, the two seats that received the highest rating (for lowest toxicity) are Britax USA Marathon ClickTight Convertible Car Seat, Vibe and Maxi-Cosi Pria 70 Convertible Car Seat, Blue Base . Both are in the $200 range. That price is still out of reach for many parents and caregivers, which is why we are asking for affordable and toxic free seats. All of the affordable seats ($150 or less) we tested received a low rating. To address the issue of safety: We always preface our reports with the fact that car seats save lives and should always be used no matter their toxicity rating. Parents can look to Consumer Reports, safercar.gov, or other safety rating resource for more information. 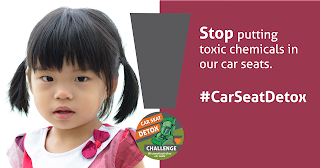 Non-Toxic Munchkin: What is the car seat challenge? 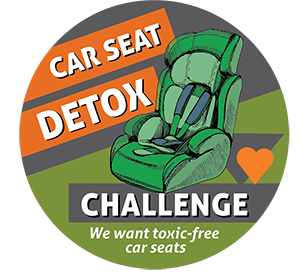 Melissa: A campaign (that) is challenging car seat manufacturers to take their designs to the next level as far as reducing and eliminating toxic chemicals. Non-Toxic Munchkin: The Car Seat Challenge campaign is calling on Baby Trend, Cosco, Evenflo, Graco, and Safety 1st to follow Uppababy’s lead. 1. Develop a safer chemicals policy and publicize it within 12 months. 2. Create an action plan to address these hazardous chemicals in their products. 3. Reduce, eliminate and safely substitute hazardous chemicals from their products. Non-Toxic Munchkin: Why did you choose to target: Baby Trend, Cosco, Evenflo, Graco, and Safety 1st ? Melissa: The Ecology Center’s HealthyStuff program tested car seats from these five manufacturers in 2016 and they all received a low recommendation. They are not the only ones with a low rating (there were five other brands). But, these brands offer affordable seats and have widespread popularity. An affordable car seat should not have to come with a chemical exposure cost. - sick and tired of toxic chemicals being used in your children’s everyday products. - If you think that car seats should keep kids safe from injury AND toxic chemicals. - If you think its ridiculous that only one car seat manufacturer has developed one model that is toxin free and that it’s high time for these large corporations to protect their consumers and invest to make toxic-free car seats that still meet fire safety standards. - because it CAN be done. And it should.